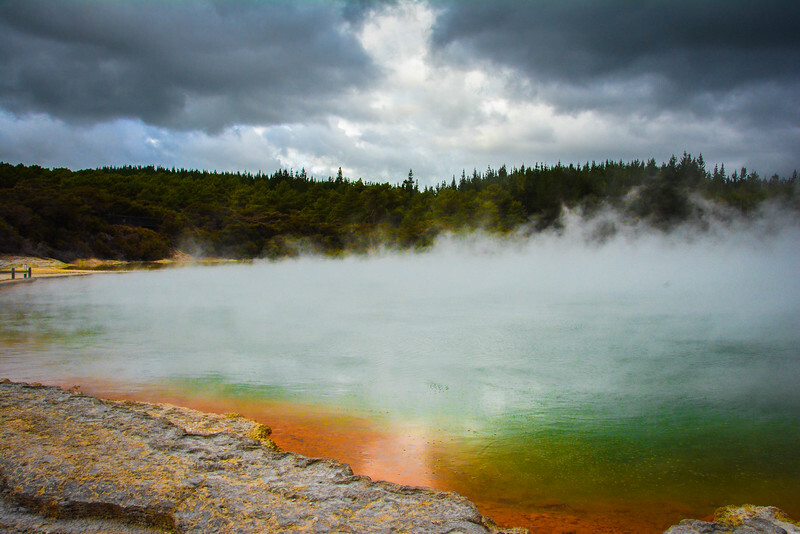 Home New Zealand Why Waiotapu Thermal Wonderland Is an Amazing Attraction? Are you ready to experience an amazing geological phenomenon? 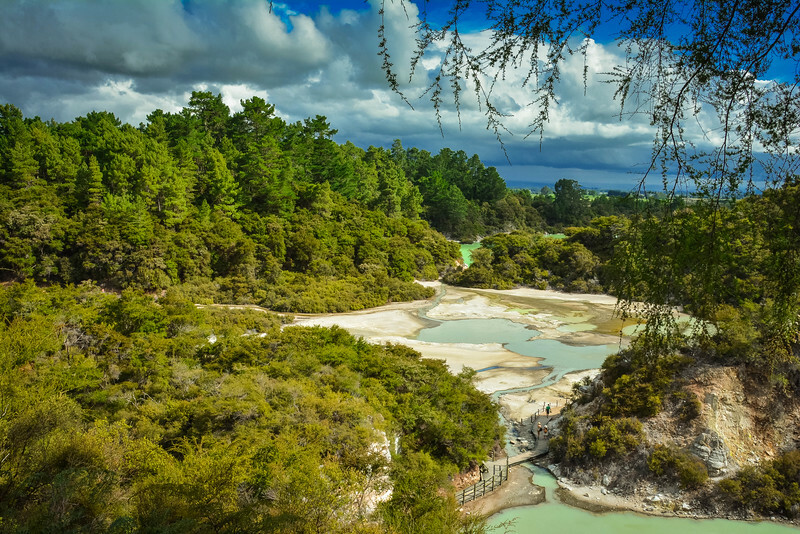 Be prepared to enjoy a breathtaking landscape of natural beauty when you enter Waiotapu Thermal Wonderland, located in the heart of the North Island in New Zealand. New Zealand is certainly not short of natural beauty and perhaps this country could be forgiven for allowing some of the most impressive sights to go unnoticed given the abundance available. 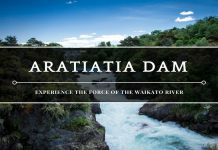 But having explored Waiotapu on our recent trip to New Zealand, this is definitely an attraction you cannot afford to miss. We have been fortunate to experience some amazing geothermal locations around the world, in particular, Geysir Thermal Park in Iceland and of course, Yellowstone National Park’s very own Old Faithful and accompanying geysers. 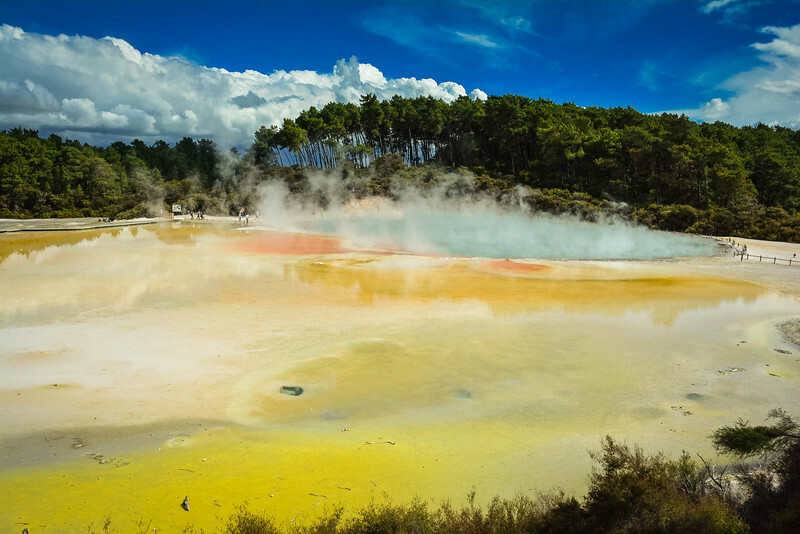 However, after visiting Waiotapu Thermal Wonderland, we can well and truly attest that this is a spectacular attraction that ranks alongside these more recognized attractions. 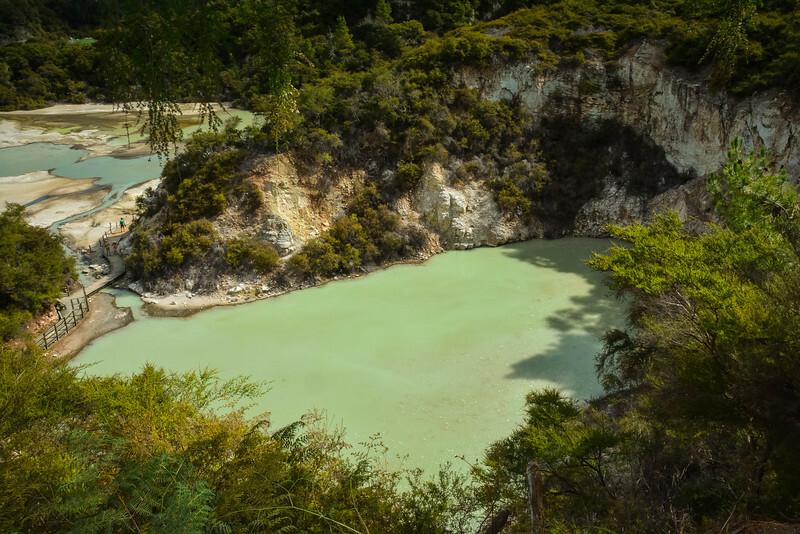 Let’s take a look at why Waiotapu (or Wai-O-Tapu) has quickly become one of our favorite attractions in New Zealand. 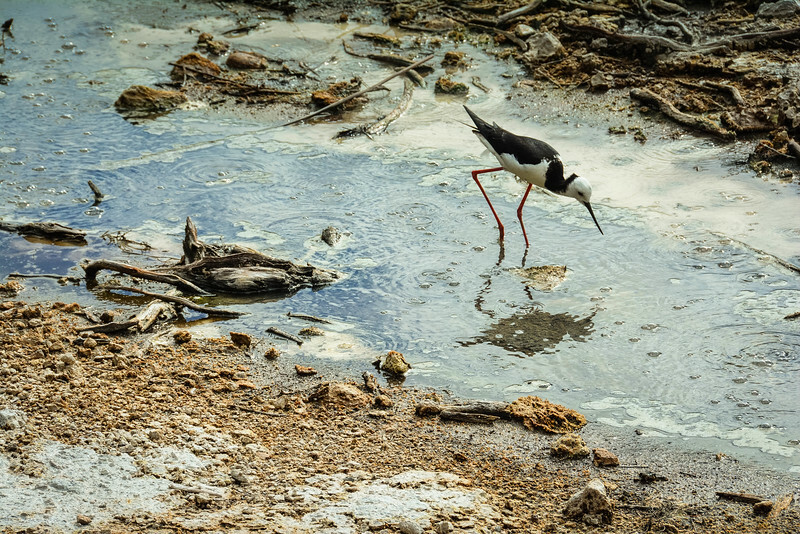 If you are planning a trip to Auckland or the North Island, be prepared to rent a car and head south to the Rotorua area. 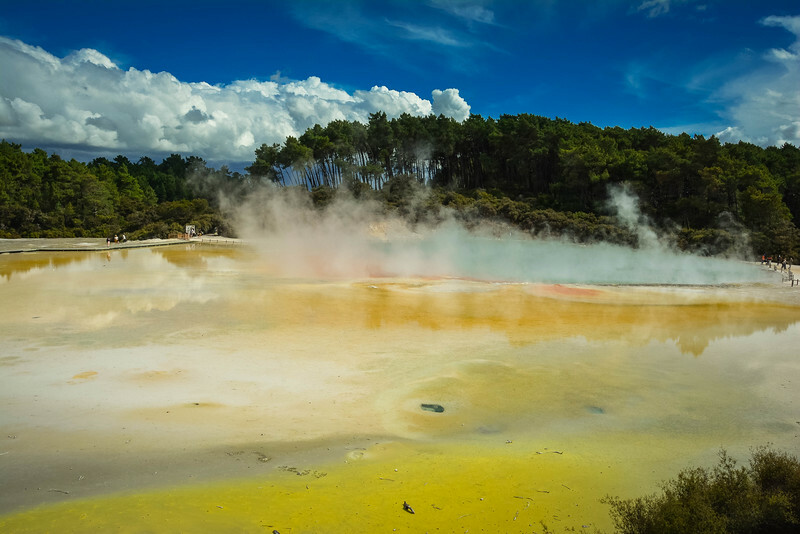 This is the ultimate geothermal hotspot in New Zealand and along with Waiotapu, you will find a number of other attractions that are worth visiting. 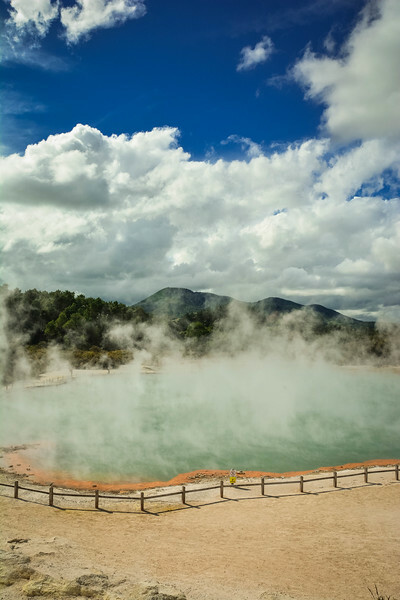 You will also likely spot a myriad of geothermal activity as you drive around Rotorua…in fact, you can’t miss it! 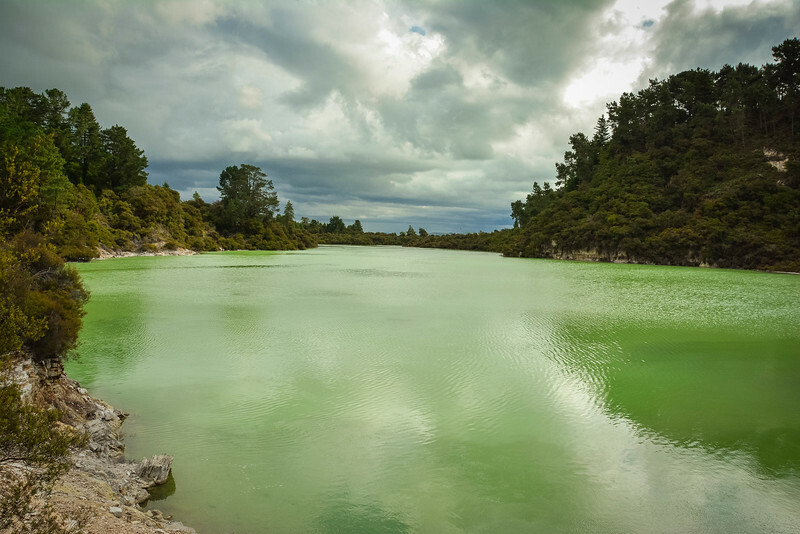 Did you know that Waiotapu is translated as “sacred waters” in the Maori language? 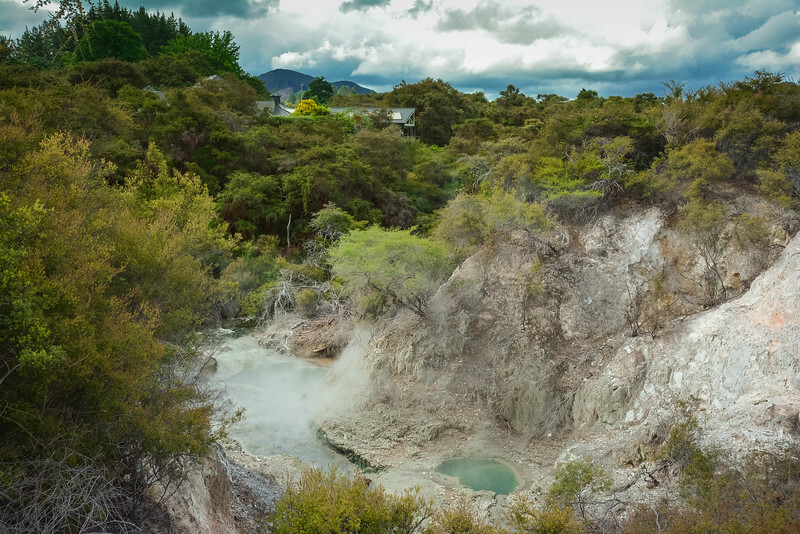 This is an active geothermal area at the southern end of the Okataina Volcanic Centre in New Zealand and well worth visiting if you have a few hours (or at half a day if you want the full experience!) to spare. We opted for Waiotapu Thermal Wonderland mainly because the name sounded really cool! In all seriousness, we heard a lot of great reviews about this place and given that we headed to Rotorua pretty late in the day, we wanted somewhere that we could explore in just a few hours. 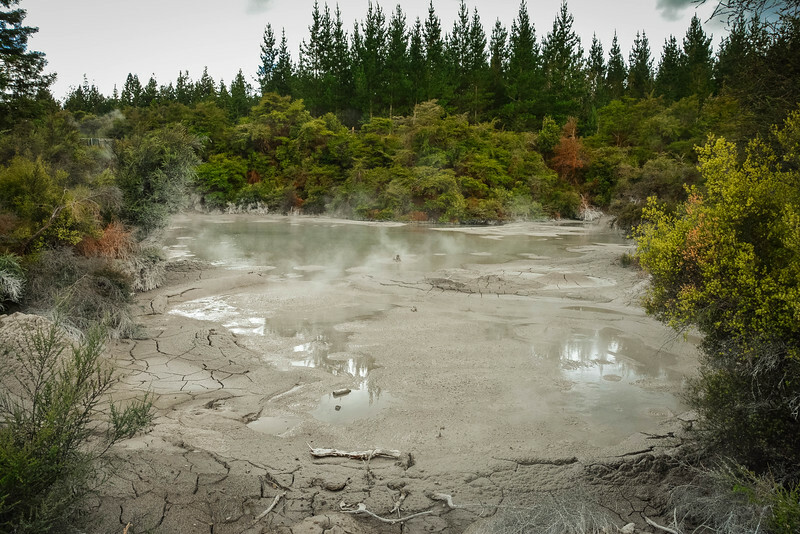 Waiotapu is open all year round though the hours are seasonal. During the winter season, there are guided tours at 11:00AM daily. As always, we recommend visiting the attractions website before visiting to ensure that times haven’t updated since the time of this post being published. 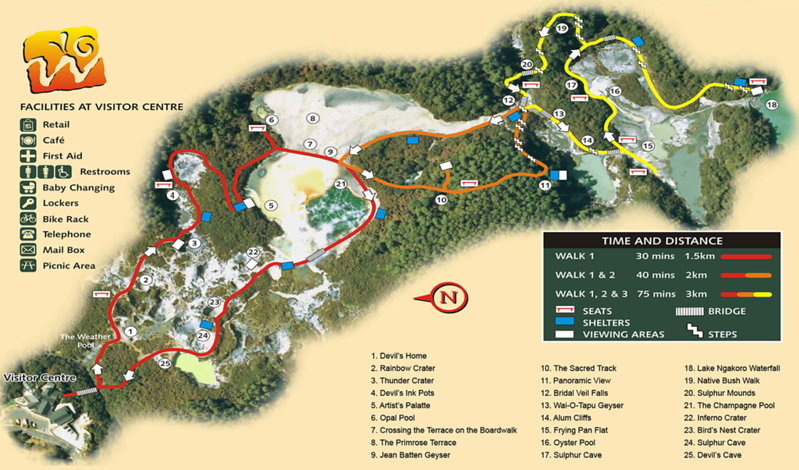 Waiotapu Thermal Wonderland is located a short distance from the town of Rotorua on New Zealand’s North Island. Our visit to Waiotapu saw us drive from Hamilton which was our base for a few days and the distance was approximately 142 km (88 miles) that took a little over 1 1/2 hours. 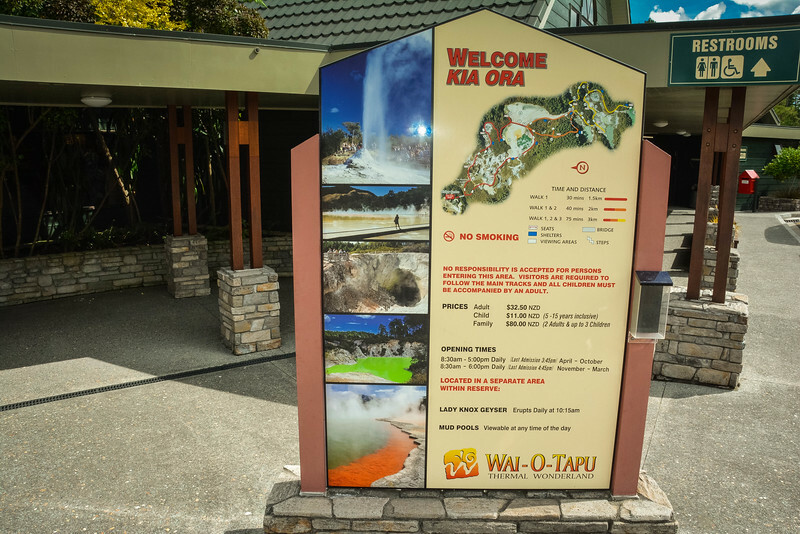 Grab a map of Waiotapu inside the Visitor Center and be prepared to have the most amazing experience wandering through a myriad of geothermal landmarks that will literally take your breath away (perhaps because of the smell but also because the scenery is so spectacular). 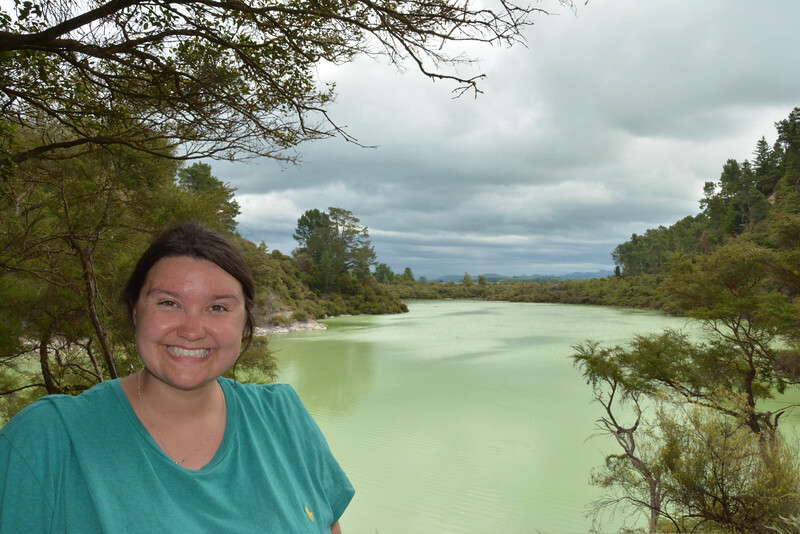 As I mentioned, we arrived around 4:00PM so we immediately felt like we had to pick up our speed as we experienced everything Waiotapu had to offer. This is an experience you can visit in a couple of hours but in hindsight, we would have preferred to arrive earlier in the day to appreciate more of this natural beauty. Let’s take a look at the three trails separately and highlight some of the best features you can expect to stumble across on your journey. 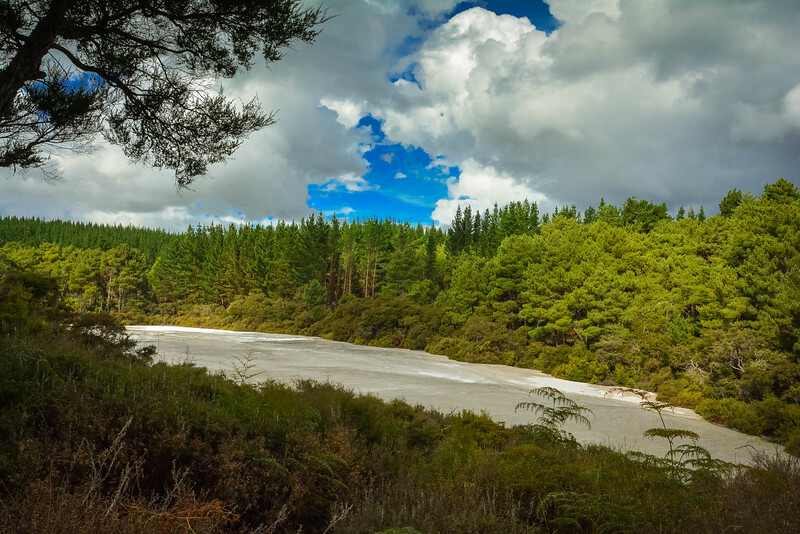 The beauty of Waiotapu Thermal Wonderland is that you literally cannot get lost…as long as you keep to the trails which you are required to do primarily for your own safety! 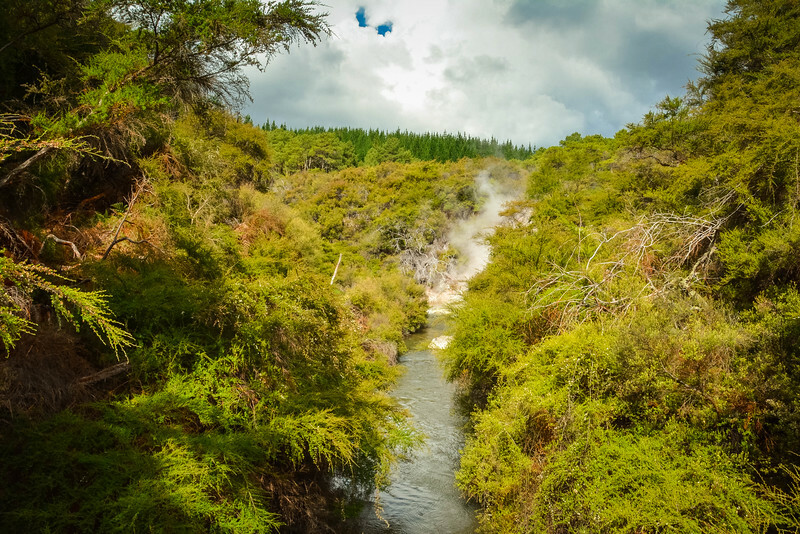 Our journey through Waiotapu’s Thermal Wonderland started the moment we stepped outside the Visitor Center as we embarked on a short walk up a steep incline and noticed the steam emitting from the stream that was flowing parallel to the walkway. 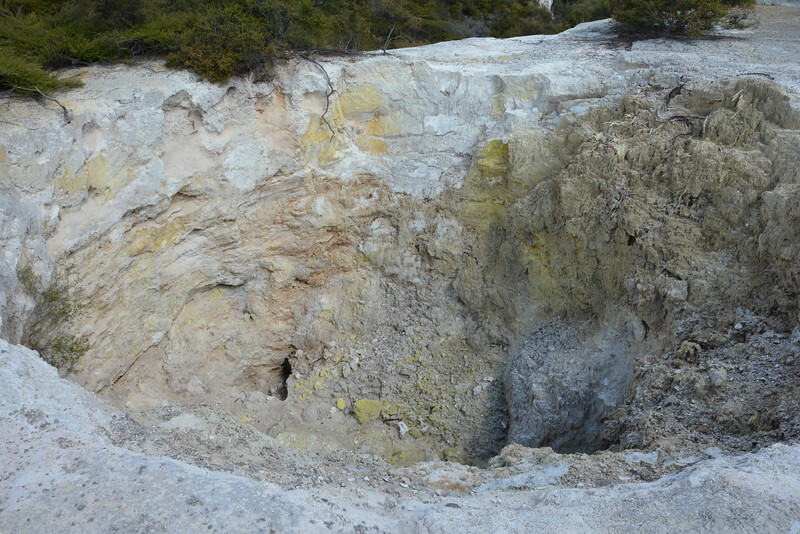 The smell of sulphur wasn’t immediately noticeable but that soon changed as we arrived at an opening and started admiring some of the popular landmarks at Waiotapu. 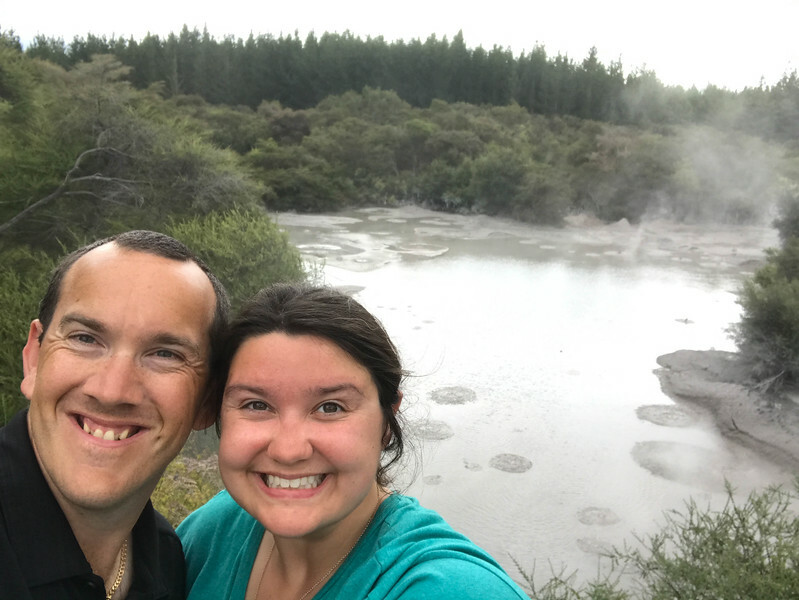 All of the iconic geothermal landmarks are named as you explore Waiotapu and we quickly stumbled across Thunder Crater and Devil’s Home as we continued to be intrigued by everything we saw. Trust me when I say that your journey through Waiotapu only gets better and better the deeper into this “wonderland” you go. 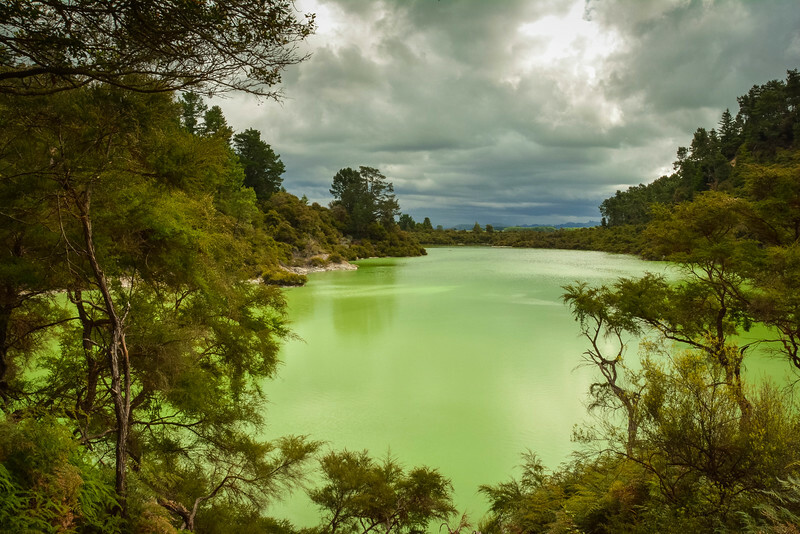 One of Waiotapu’s infamous attractions is Artist’s Palette for many reasons. Not only is this a geological phenomenon but it’s a breathtaking scene of color that immediately captures your attention. It’s perfectly named as the array of colors creates a vibrant landscape that is a photographer’s dream. 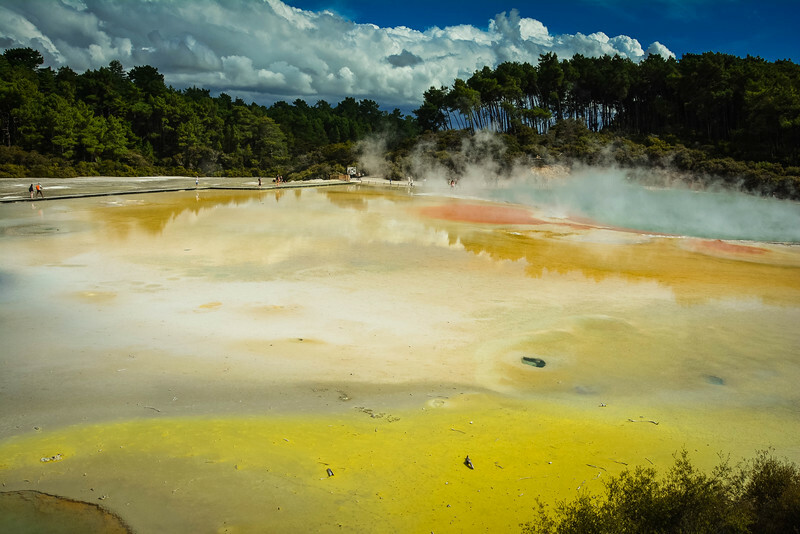 Many of Waiotapu’s landmarks have very subtle colors but the Artist’s Palette’s vivid scheme provides visitors with the picture perfect location that instantly makes you want to return to this attraction. 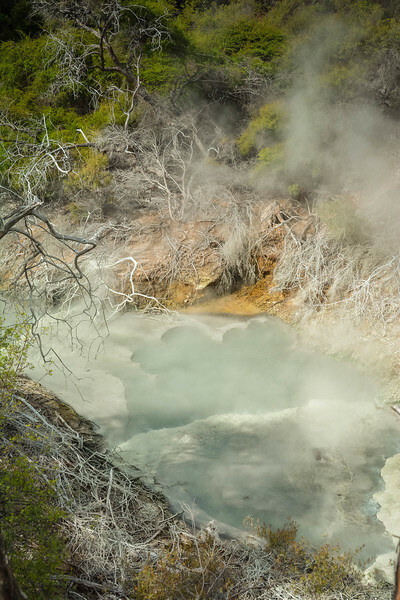 The large steaming pool that has a seriously pungent smell is known as “The Champagne Pool.” It is renowned as being the largest of Waiotapu’s hot water springs. A series of earthquakes in New Zealand have tilted the spring, causing strong mineral water to flow over the crusted surface. As the above effects took place, this in turn has created the striking colors that we see today with the various minerals becoming apparent throughout the landscape – hence the name Artist’s Palette! You can read more about what each colors represent when you explore Artist’s Palette as there are a series of information boards highlighting the key characteristics of the geology in this region. 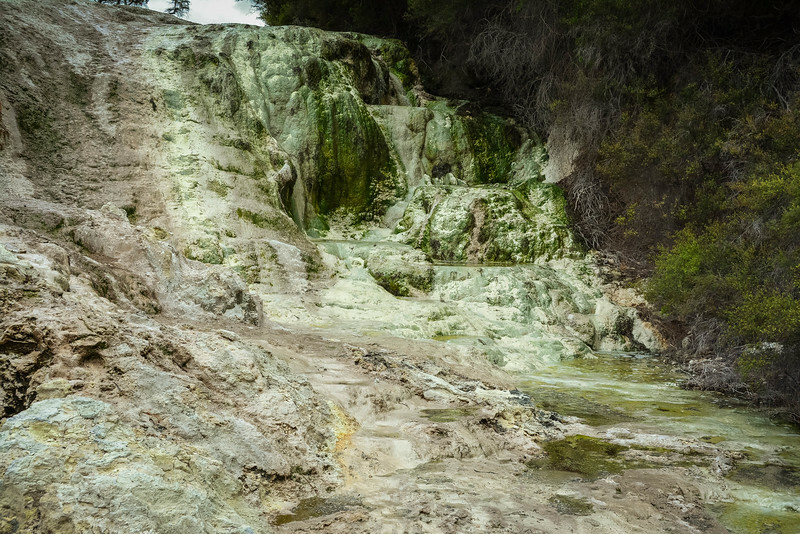 By the time you reach the start of the second (orange) trail, you could be forgiven for thinking that your experience at Waiotapu Thermal Wonderland couldn’t get any better. If you follow the directions of the arrows on the map, you will head through a wooded area where you may be fortunate to see some wildlife roaming around but it’s the return trip where you walk alongside the geothermal pool that is really spectacular. 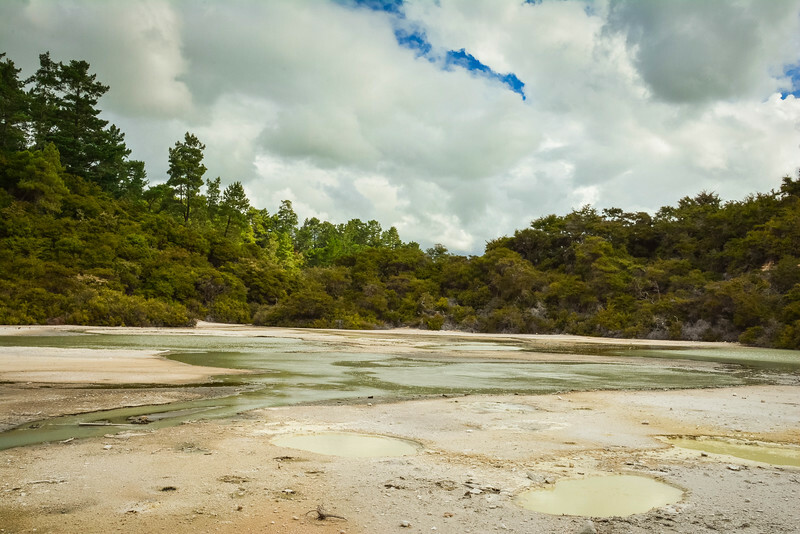 This area of silica deposits may not be the most eye-catching landmark at Waiotapu but it’s certainly one that you will appreciate given the vast expanse of land it covers. 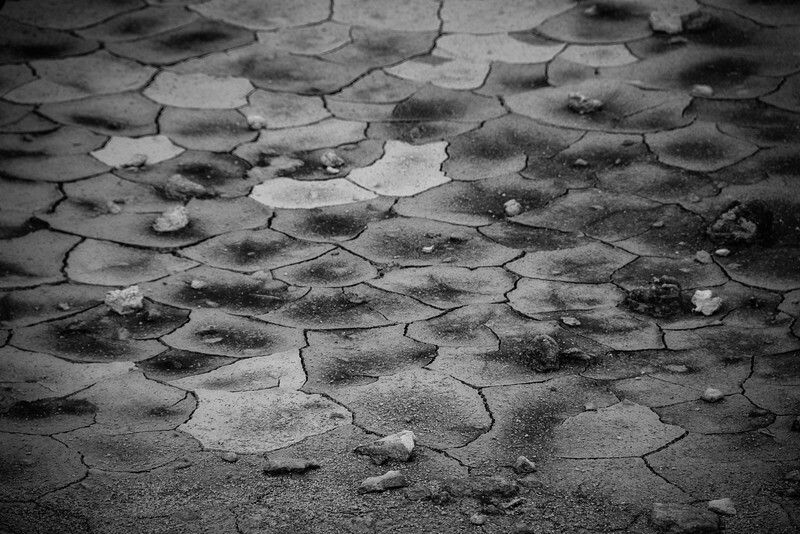 It’s the epitome of a geological mud flat that we associate with geothermal landscapes around the world. 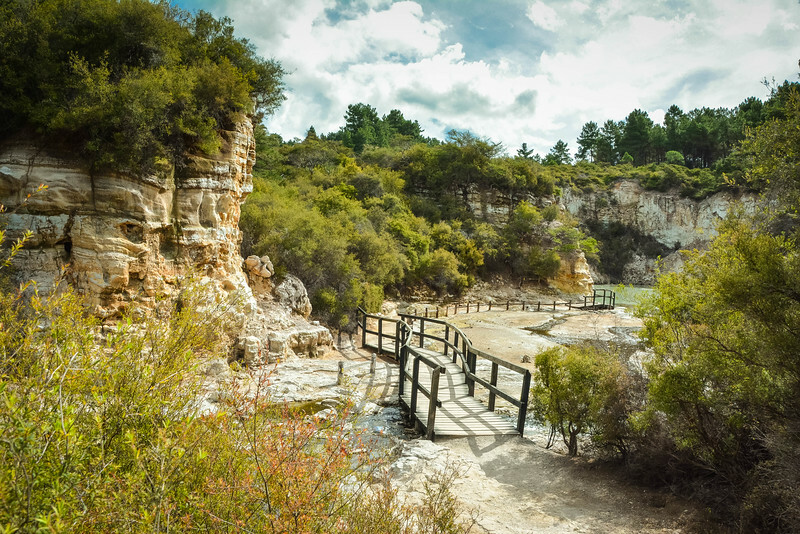 The final section of Waiotapu Thermal Wonderland is renowned as being the most challenging but the reality is that for anyone capable of hiking a short distance up and down a few stairs, you will be perfectly fine. The hardest part is avoiding stumbling into the geothermal pools that you walk across, simply because you are in awe at their inherent beauty. The journey along the yellow trail begins at Bridal Veil Falls as you clamber down a pretty steep incline and then start your adventure across a landscape with cliffs surrounding you and pools emitting warm steam in front of you. 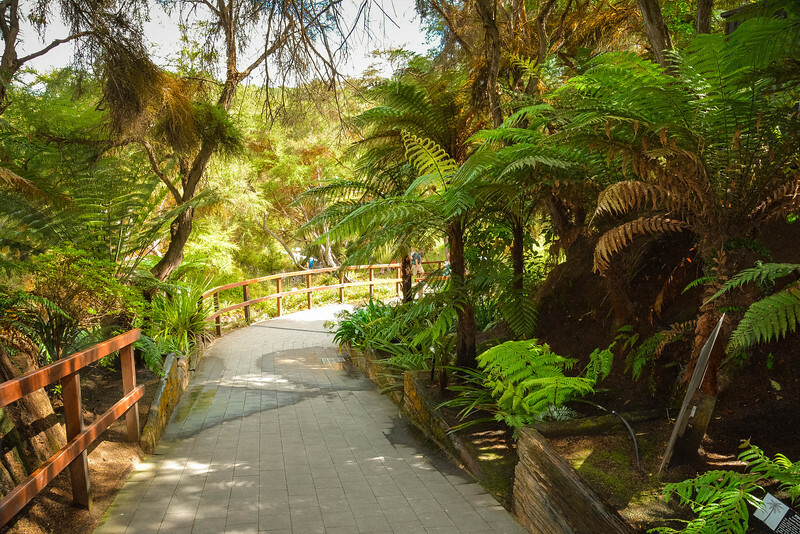 If you love the thought of being part of a geothermal experience, this is certainly the place to take a moment and contemplate your surroundings. 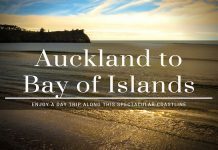 Our tour continued as we weaved in and out of the trail, overlooking the stunning Frying Pan Flat, before heading back around the Oyster Pool and up a series of steps leading to the finale at Waiotapu. Trust us when we tell you, it’s worth the wait in gold (or sulphur which is probably more appropriate here!). Lake Ngakoro is a breathtaking sight. 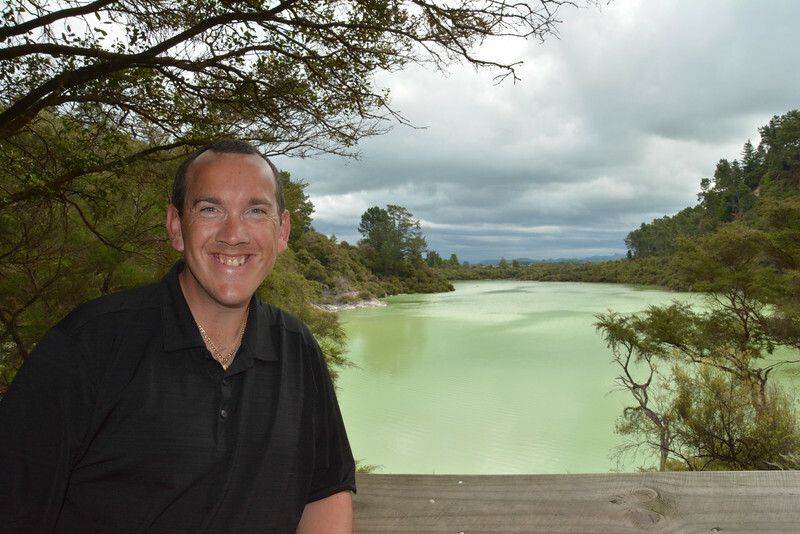 A fluorescent bright green lake stands in front of you as you reach the end of the advertised trail at Waiotapu. There is an additional trail that will take you around the lake but you are pretty much on your own with this one as the map ends at Ngakoro. You may be wondering what makes this lake so green? Don’t worry, we were thinking the same also! It is caused by the sulphur and ferrous salts mixing in the water, so I don’t think this is somewhere you would want to take a swim though I have to admit it looks pretty inviting. We felt pretty fortunate to have the opportunity to experience Lake Ngakoro and we spent about 10 minutes just stood there admiring the views. It was a pretty secluded spot at the end of the trail but just as we started our hike back to the Visitor Center, one of the local park rangers was informing people Waiotapu was preparing to close. We would have been extremely disappointed if we hadn’t see Lake Ngakoro but luckily we made it just in time! 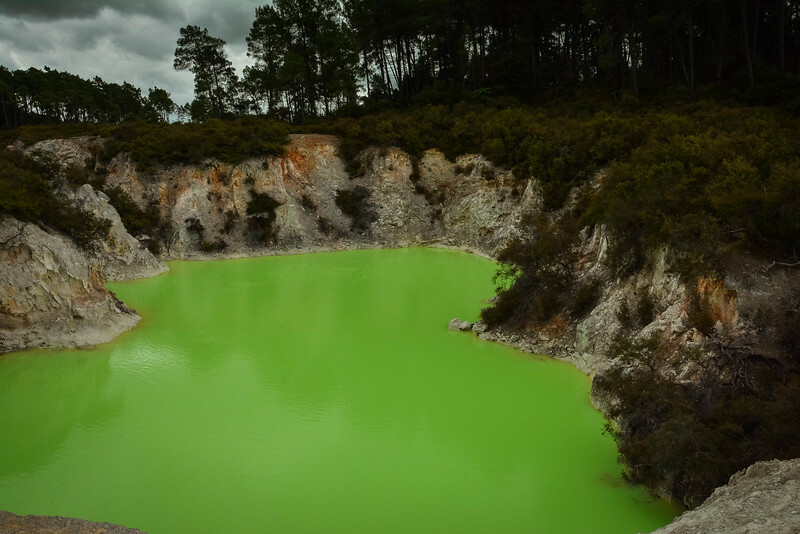 We did have time to wander past the Devil’s Bath aka “pool of Mountain Dew” that was yet another example of fluorescent green water at Waiotapu. 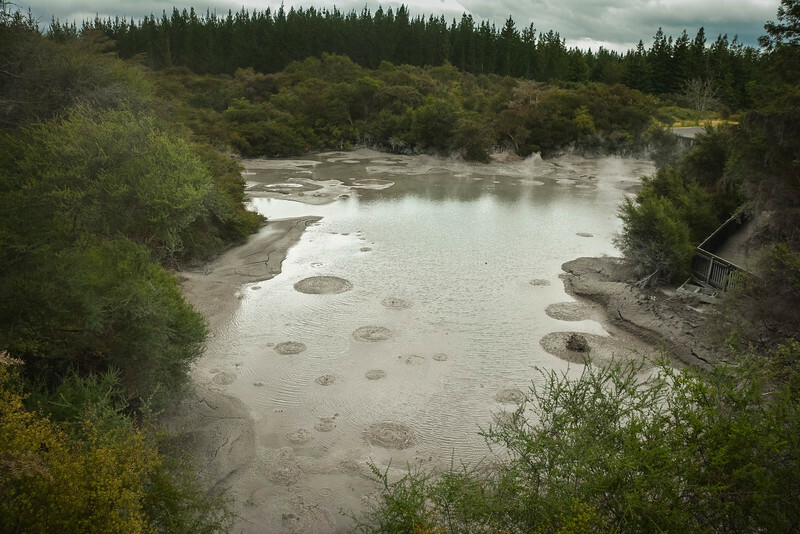 As we left the car park at Waiotapu pondering the amazing experience we had, we almost missed one last attraction – the Mud Pools. Accessible either when you are entering Waiotapu or leaving, we soon found out that this “hidden” attraction is one that you cannot afford to miss. After reading about the history of this mud pool, it seems that this was the site of a large mud volcano that was destroyed through erosion in the 1920s. 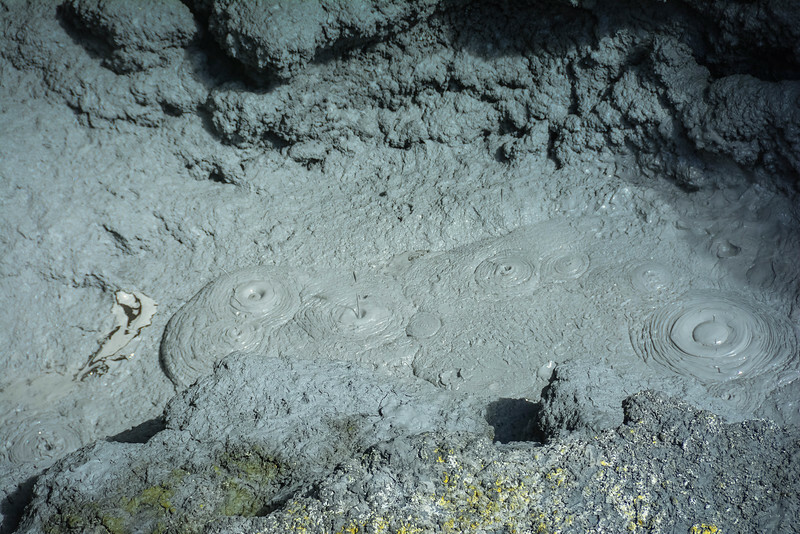 Today, it’s one of the best examples of erupting mud in New Zealand. 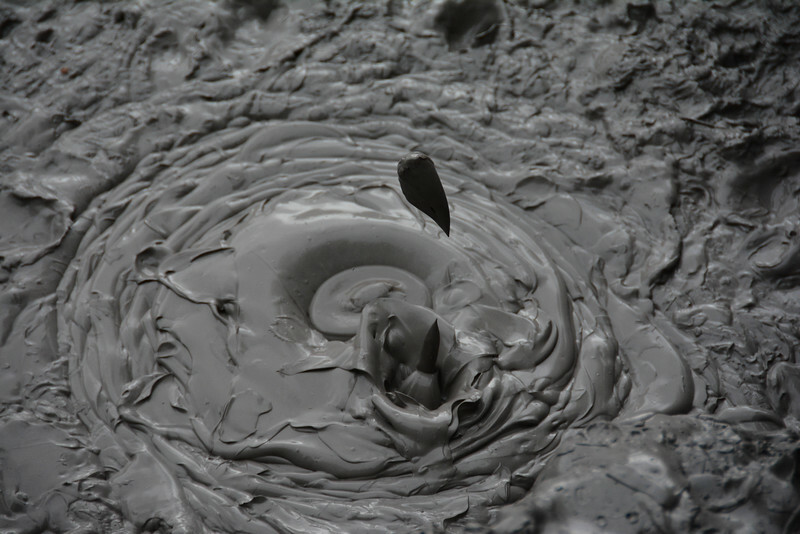 There are a couple of different viewing platforms where you can access the mud pools and it’s actually a quirky experience to listen to the sound of the mud “exploding” as it erupts, while you may be fortunate to see a few larger eruptions at this site. Don’t worry though, you are not likely to see mud flying over the barriers and instead, it’s a more calming sight to admire the unique character of this geological phenomenon. 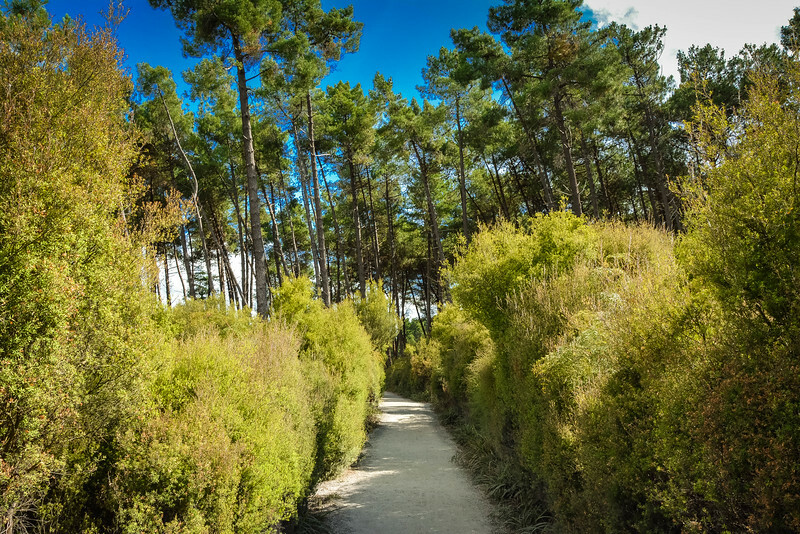 Waiotapu has done a great job creating three distinctive trails around this area. 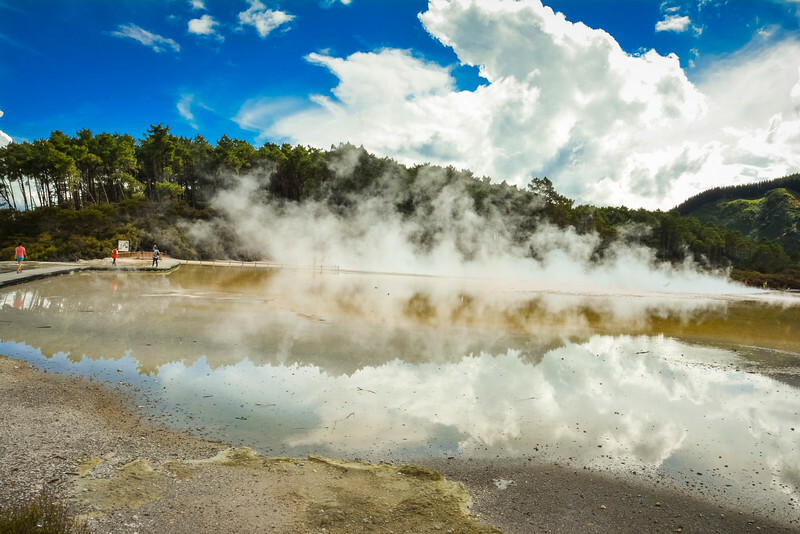 Each one provides something a little different in terms of geothermal activity yet still creates an intriguing experience regardless of how much or how little you choose to see. 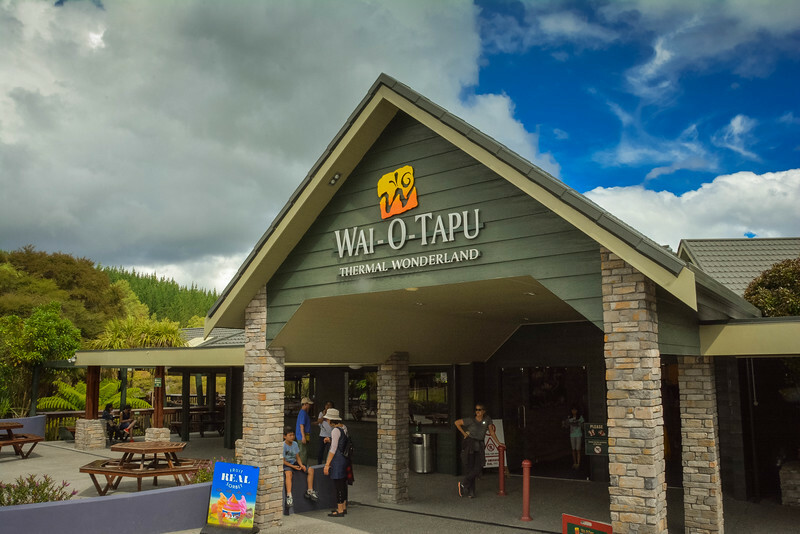 Our only regret was that we didn’t have more time to spend admiring all of the attractions at Waiotapu Thermal Wonderland. We strongly recommend visiting earlier in the day to allow more time but even if you visit late in the day, you can certainly make your way around all three trails in a little over one hour. Favorite spot at Waiotapu? I have to say we both agree on two places! Lake Ngakoro is stunning, simply because of the apparent seclusion here (it’s possible that is just because we were one of the last visitors to arrive here) and the gorgeous green color of the water. It’s one of the most photogenic spots we discovered around the North Island of New Zealand. Secondly, the Champagne Pool/Artist’s Palette is another breathtaking landscape with a myriad of colors blending together to create an amazing sight. 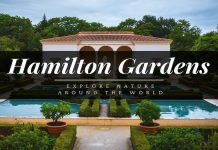 Previous articleHamilton Gardens New Zealand – How to Enjoy the Beauty of Nature? Next articleWhy Climbing Diamond Head Needs to Be on Your Radar? It is one of my major dreams to visit New Zealand! Are there thermal springs installations there, where people can bath inside these waters? Wow those pictures! It doesn’t look real. Amazing! I cannot wait to visit there someday. 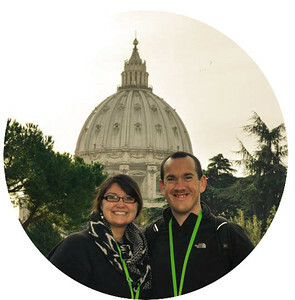 Great job writing about your experience. 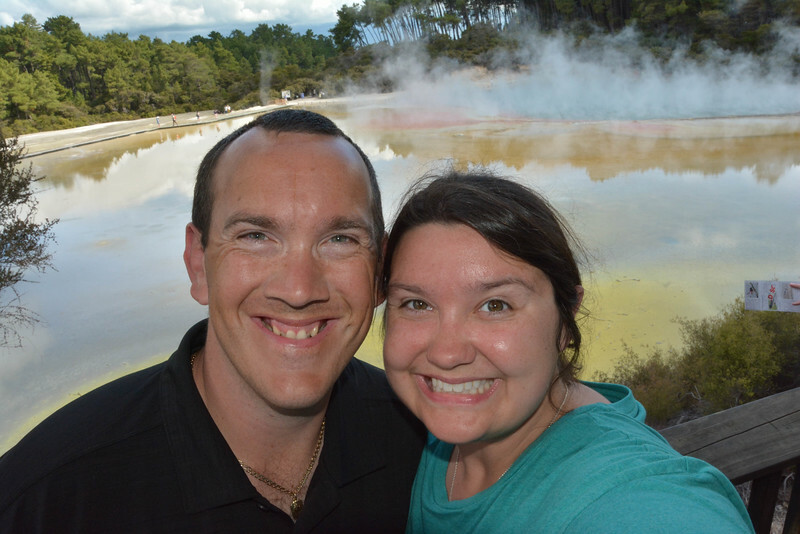 We have been to Wai-o-tapu twice and loved it each time. It is hard to go past The Champagne Pool for sheer natural beauty. GREAT shots Chris. We want to get to NZ soon. So much natural beauty there. I also find it neat how the recent quakes actually tilted the earth, causing that flow of water you noted. Nature always amazes. I’ve never heard of Waiotapu Thermal Wonderland before but I’d love to visit some day. It looks so amazing.